These were so great! Definitely a keeper! On a recent school day afternoon, I received a text from one of my daughters. It was about an hour before I had to leave and she’d be arriving home while I was gone, but I wouldn’t be back for quite some time. Her lunch had been ruined. I can’t remember the reason why or specifically what happened. My memory isn’t what it used to be. She was annoyed and she was already starving, with a couple of hours to go before she’d arrive home. I didn’t have an after school snack planned, and she knows how to make a bagel, cereal, a sandwich, things like that, but I had an idea. 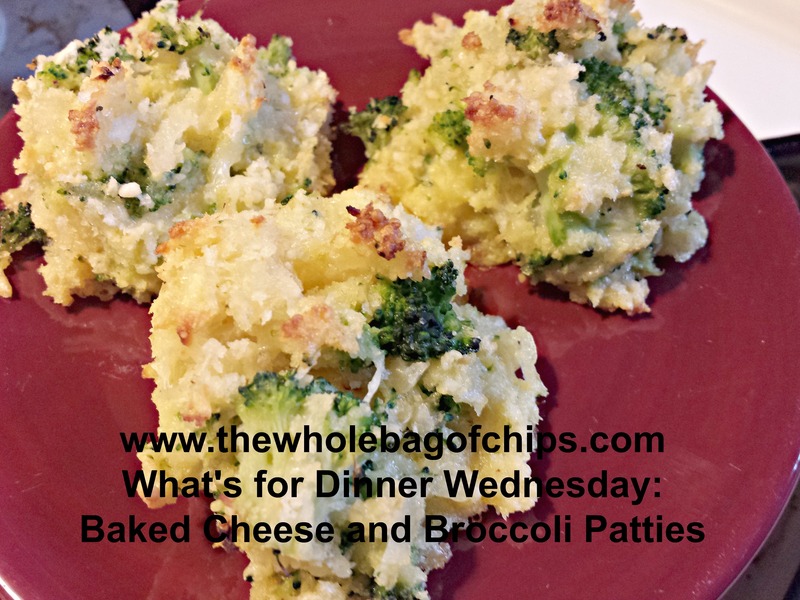 I looked up a recipe I’d been wanting to try for a while, one I’d seen floating across my Facebook page for Baked Cheese and Broccoli Patties. Now I know that doesn’t sound like a typical yummy after school snack, it’s definitely not chocolate and not sweet, but it’s savory and my kids actually all like broccoli. In fact, this one in particular loves it, and her winning recipe that got us to the White House in 2012 was a simple broccoli and cheese omelet. Rather than let her come in and make just anything for a snack, which was now replacing her lunch, I thought maybe I could leave her these to just reheat and she’d get something a little warmer and more nutritious than a bowl of cereal. I checked out the recipe, checked out the time and figured out that if I moved quickly, I could squeeze in the prep and cook times before I left. They’d be done and on top of the stove when she got home. It might even make her day a little better, which would be an added bonus. They were delicious. I texted her a photo of them when I knew she was out of school, on the bus, on her way home. “Just reheat and eat,” I said. She was so happy. So hungry and so happy. I later texted again to see if she liked them and she said she loved them, that they were very similar to this recipe that we’d gotten out of our cookbook that we’d received at our White House luncheon, minus the hot dogs and pasta. When my other daughters got home from school, they too reported loving this after school snack. So I call this a great recipe success! All thumbs up, a quick and easy recipe and it can be used for a side dish with a meal or on its own; even as an after school snack. Who knew?! When I saw this recipe go by on Facebook, a friend was sharing it to another friend’s wall, but there was no originating information to go with it. I did an online search, saw the recipe on the Food.com site, but the photo was different than the one in the recipe I had, and this person too, reported getting it from a random Facebook post. However, someone put up a comment with the origination of the recipe, so I’d like to give credit here to the Po’Man Meals blog. Thanks for inspiring a whole lot of us! I’m using the ingredients and directions I found on Food.com, which is the same as the one I have printed out at home, so thanks to them as well. Heat the oil in a small pan over medium heat, add in the garlic and onions. Season with salt/pepper to taste. Sauté until onions are garlic are tender, set aside to cool. Add the broccoli to a kitchen towel. Wrap the towel around the broccoli and squeeze out the extra moisture. Pour the drained broccoli into a large bowl, add the onion and garlic and mix gently. To the same bowl, add the panko, the cheeses, eggs, and salt/pepper to taste. Mix together and form into patties, place on the prepared baking sheet. Bake in the preheated oven for 15 minutes. Flip and bake for another 15 minutes if needed, or until browned and crispy. Definitely saving this one. Looks like the perfect appetizer for a holiday dinner!